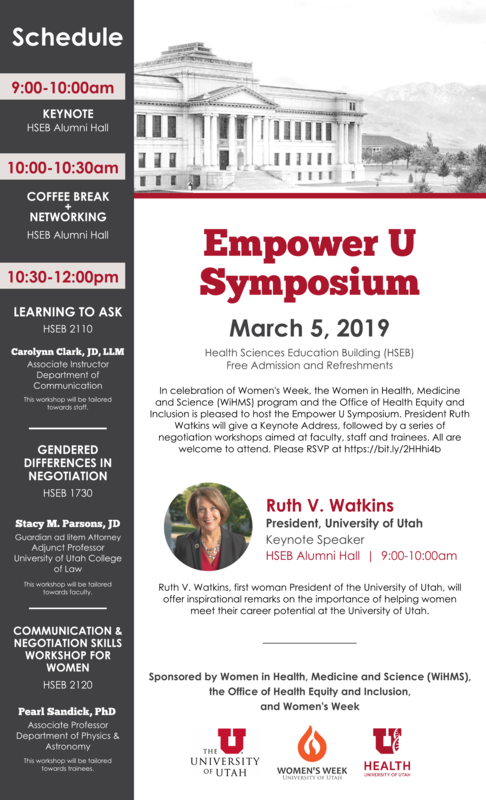 In celebration of Women’sWeek, the Women in Health, Medicine and Science (WiHMS) program and the Office of Health Equity and Inclusion is pleased to host the Empower U Symposium. President Ruth Watkins will give a Keynote Address, followed by a series of negotiation workshops aimed at faculty, staff and trainees. All are welcome to attend. Ruth V. Watkins, first woman President of the University of Utah, will offer inspirational remarks on the importance of helping women meet their career potential at the University of Utah. Carolynn Clark, JD, LLM; Associate Instructor of Department of Communication. This workshop will be tailored towards staff. This workshop will be tailored towards faculty. This workshop will be tailored towards trainees.